No shadow, no doubt, Miley Cyrus is the pop act crossing the border from the murky world of mainstream into wider cultural acceptance — not least for her great work as a LGBT ambassador, but a general disobedience in toeing the line of compliance works wonders for credibility. 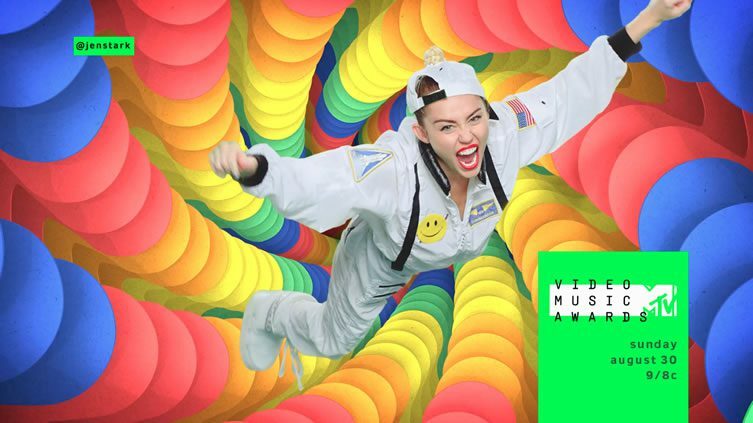 As a testament to her status as one of the biggest active pop stars, Cyrus hosted the 32nd MTV Video Music Awards this weekend; an event that saw Nicki Minaj’s spat with the provocateur subsist and Kanye being predictably mental. 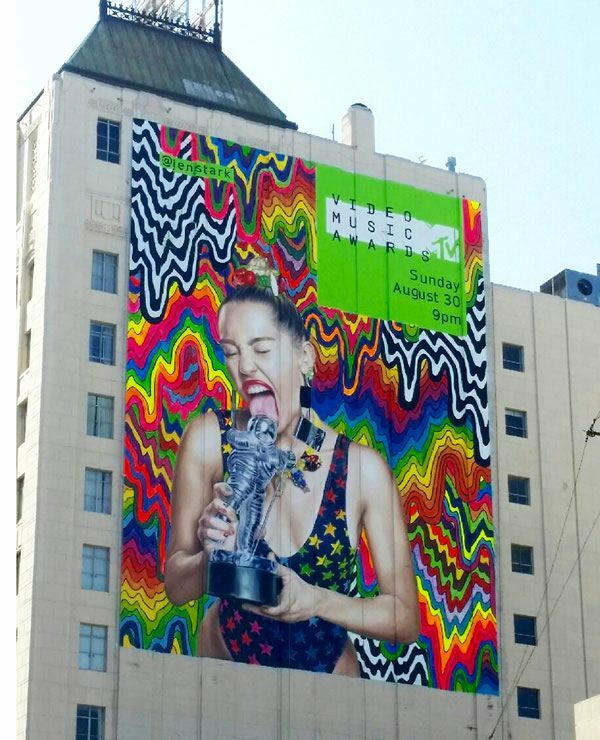 Those who suffered the tedium of sitting through the event will have been rewarded with some psychedelic spectacle, courtesy of Miami-born, L.A.-based artist Jen Stark; whose contributions were announced with a staggering hand-painted billboard in Los Angeles, leading up to the ceremony. “In an event of cosmic serendipity,” Stark’s representatives Eric Firestone Gallery tell us, “Wayne Coyne of the Flaming Lips introduced Cyrus and Stark just as MTV producers were considering Stark’s work for the awards show. Her psychedelic art proved the perfect match for Cyrus’ boldly bohemian persona”. 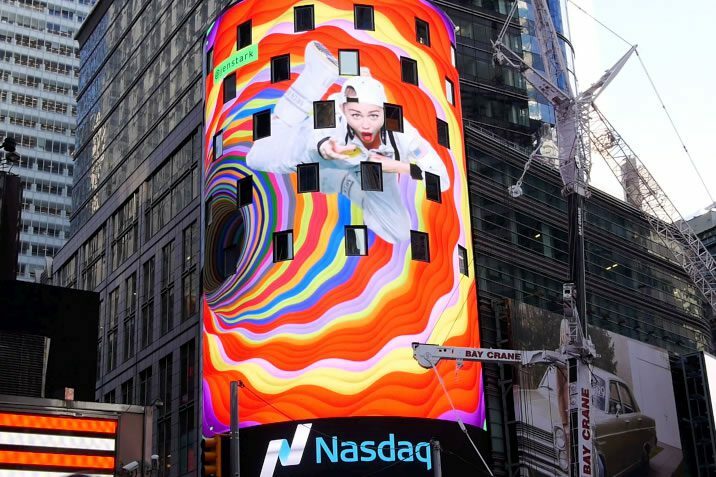 Accompanied by video installations playing in New York — at Times Square and Port Authority Bus Terminal — the L.A. billboard represents a vision beyond advertising, and a blistering showcase for Stark’s multi-layered, kaleidoscopic artwork. Having exhibited in major galleries around the world, the Floridian’s work often takes the form of painstakingly detailed paper sculptures that draw on nanoscopic designs that appear in the natural world.